» Hourly weather data from the Arctic LTER Moist Acidic Tussock Experimental plots from 2000 to 2010, Toolik Filed Station, North Slope, Alaska. Hourly weather data from the LTER Moist Acidic Tussock Experimental plots. 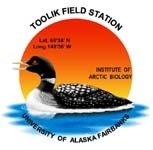 The station was installed in 1990 in block 2 of the Toolik LTER experimental moist acidic tussock plots. The plots are located on a hillside near Toolik Lake (68 38' N, 149 36'W). Global solar radiation, photosynthetic active radiation, unfrozen precipitation, air temperature, relative humidity, wind speed, and wind direction are measured at 3 meters. Additional sensors in greenhouses and shade houses plots measure air temperature, relative humidity and photosynthetic active radiation during the growing season. The sensors are read every minute and averaged or totaled every hour. In 1990 a data logger and sensors were installed at block 2 of the Moist Acidic Tundra (MAT) site at Toolik Field Station Long Term Ecological Research Site (LTER) to monitor weather and soil temperatures. Please see temperature soil files for soil temperature information . For sensor and column labels CT = Control, GH = Greenhouse and SH = shade house. Note that shade cloth and plastic greenhouse material are attached to a permanent frame structure every spring (early to mid June) and removed in late August each year. Thus temperature measurements in the control plot may be representative of all three sites when the covers are not present. -IMPORTANT NOTE REGARDING WINTER and LATE FALL/EARLY SPRING: Instruments are NOT maintained from Mid August (actual date varies by year) to Mid June (date also varies by year). SENSORS MAY BE COVERED WITH SNOW and/or FROZEN. Blatantly erroneous has been removed however all data from winter months must be used with caution. -The covers on greenhouses and shade houses are removed every fall and reinstalled every spring as described above.